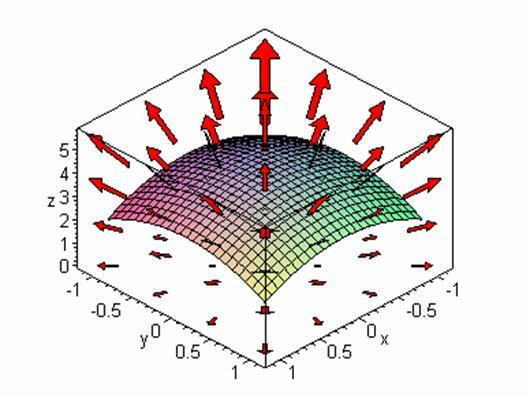 Today I want to comment on a very important physical concept from the mathematical point of view, the scalar field. A scalar field is just a function that assigns each point a number, a scalar. It is a very simple concept. Obviously the concept of scalar field has some restrictions, the first is that at each point (defined by ) there can be only one value, that is, it is one-valued. With this we make sure that the field is unique anywhere. Thanks to this, since it is univaluated we can do something very beautiful that is to represent it in a simple way. By having a single value at each point we can take points with the same value and draw a surface. This is called equiscal surfaces and, as an understandable example, it would be when we look at a map of heights as the sites that are at the same height are represented by a cut or a surface (in this case , In two dimensions since the plane is, as its name indicates, a plane of two dimensions). Let, the equi-scalar surfaces are those in which where K is a constant and taken in the dimension we need, for example, in would be . Now, a vector field is similar to the above but instead of assigning a scalar (a number) at each point assigns a vector. That is, it is the logical continuation of a scalar field. For example, a vector field is a function that each (x, y, z) assigns a coordinate vector (a, b, c) where and . Obviously, the vector field, like the scalar field, must have a unique vector result at each point. That is, it must also be one-valued. And if a scalar field is represented by surfaces with the same value or equiscalares (what a name), a vector field is represented by what is called field lines (field because it is a field Vector, do not think otherwise, even if it helps). The interesting thing about the field lines is that they do not go in the direction of the field but are tangent to it. That is, the field lines are the set of tangent lines to the field. These lines form a thing called soft curves. As a smooth curve it is indicates that the deviation of the same is never 0 at a time in all its coordinates. In other words, (attentive to the concept), we can define it as a function (wait, that is exactly what a vector field does), that each coordinate, through an application, makes it correspond to a value and, therefore, to each vector It makes another one correspond. For this reason we can derive (partially) each “of the coordinates”. It will be a smooth curve if, deriving, the value is not zero in all the partial derivatives at the same time (it can be in one, two, but not in three – in the case of three dimensions that is the easiest to understand). Usually the circulation (the integral) is calculated in a certain way, that is to say, according to a pair of points and through a determined curve. But that is obvious. Let’s get that way out and the length. The flow is similar to the circulation except that instead of taking a path and making the integral along the path and two points would be done on a surface. Where the only thing to keep in mind is that is a vector of the surface that is nothing more than a vector normal to the surface whose modulus is the area of this. The vector and scalar fields are very important for physics because they help to understand the movement of a particle or group of them under the influence of external forces apart from helping us to understand these external forces, their origin, their “force” and direction in space. And when I say forces I mean all kinds as you have seen in the examples where, consciously, I have not spoken of electromagnetism or electric forces, forces where flux and field look like natural words. As you see, I wanted to briefly focus on the mathematics of the subject; That which gives body and truth to things.